Home / Penguins / Introducing Patch Penguin! Stuffed penguin Patch is looking to bring happiness and joy to a lucky home. This penguin’s cute face and soft body are perfect for cuddling. Patch loves to find adventures and is the best listener, especially when you’re telling about the adventures you’ve had or want to have. If you need someone to support your creative endeavors, Patch is the penguin for the job. Our newest penguin is the second in the Black and White series. Patch is made with faux snow leopard fur, which features super soft white fur with black undertones. Patch’s feet and beak are made from fabric for toy plushies. His eyes are hand embroidered, and he’s stuffed with Holofiber. Patch stands at about 6.5 inches. If you’d like to dress Patch in a handmade outfit of your choosing, we can do that. 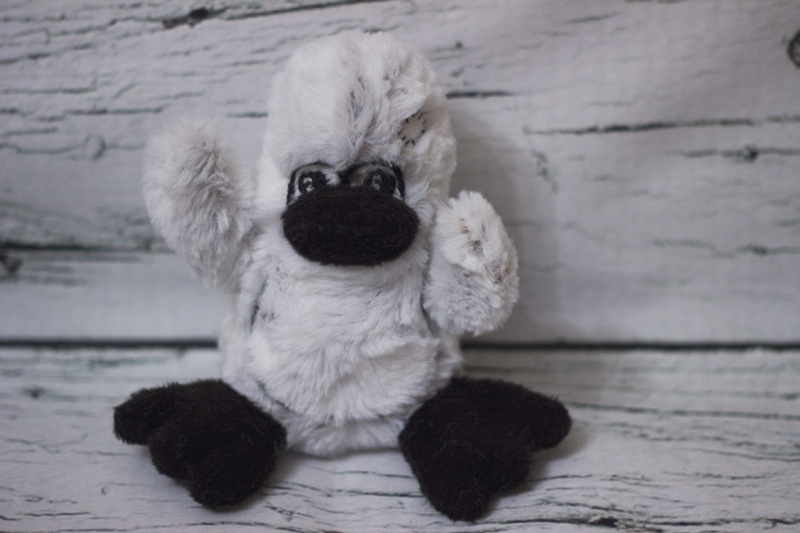 Our stuffed penguins are handmade with joy and love. They make us laugh when we see them, and each has its own personality. If you’d like to order Patch, click on the link below. Or choose another penguin, we have our original colors and several already have costumes. Order original white penguins without clothes. Order original white penguins with clothes. Our penguins love to cosplay!